This Love Tarot spread is for anyone who is single and looking, wanting to know when and how love will appear in their life, as well as (and this is clearly the most important part) what you can do to invite love in. Light a pink candle and invoke the protection and guidance of Archangel Anael as you lay the cards out and thank Her for Her help when you gather the cards back in. The most auspicious time to perform this divination would be on a Friday on or near a Full Moon. The corresponding deities are Venus, Aphrodite and Cupid. 1. State of your heart – this card describes the energy flow of your heart chakra at this point in time. It indicates how ready you are for true love. Excellent cards in this position would be The Empress, The Lovers, 2 of Cups, Ace of Cups, 9 of Cups, The Star, The Sun and The World. 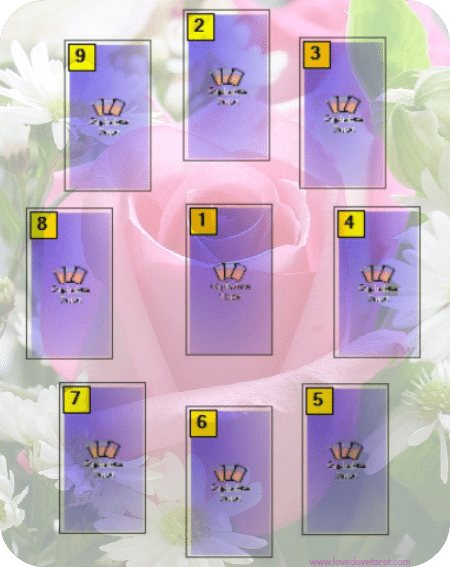 Most cards will indicate a need to release blocks to love. Embrace the challenge with as much enthusiasm as you can muster. Know that you are worthy of love and vow to simply release any blocks to giving/receiving love as and when you become aware of them. Ask Anael to help with this. 2. Cupid’s arrow – this card tells you how Cupid’s arrow will strike. It indicates how you will meet. The Ace of Swords, Page of Swords or The Star (Aquarius) could indicate meeting Online. The 3 of Wands (the ‘networking card’) could indicate meeting at a Conference, while the 8 of Pentacles indicates meeting at your regular place of work. With the Page of Pentacles it is likely that you thanks to studies and taking the same class. The 4 of Wands indicates meeting during some kind of celebration in your own or a friend’s house etc. The Fool, The Hanged Man and Judgement showing up here means you’re not meant to know – for now. Try again at a later date. 4. Best approach – this card shows you what you could start doing or should be doing more of right now in order to increase your chances of manifesting true love. 5 – 6. Clues – these two cards provide clues about the personality, looks, profession etc for your future lover. 7. Sign – this card gives you a sign, something to bear in mind for your first meeting. Pay close attention to the visual symbol that stands out the most in this card. Whatever it is, say it out loud and allow your mind to free associate, writing down whatever pops into your head. Think about how this symbol relates to the qualities you wish for in a mate and take some more notes. 8. Avoid – this card shows you something you should avoid completely or do considerably less of if you wish to manifest true love. 9. Capitalise on this! – this card shows you a strength or asset that you should bring to the fore when you start building your new relationship. Feel free to ask questions about this spread in the comments section below. Please note that I cannot answer any questions about the card in position 7 since the interpretation of that card depends entirely on how you connect with the visual clues in it.